As is customary for Leeds reunions, our friendship group went for a few social drinks then sauntered over to Woodhouse for a curry at the hallowed palace of meat: 7 Spices restaurant. Once seated, we proceeded with starters: there’s an unwritten rule that the only opener you’re permitted to order is the special tandoori mixed grill: a legendarily opulent congregation of succulent spiced meats served on a hot oval sizzle dish atop a bed of onions caramelising before your very eyes. Five people ordered said starter and a collection of mains ranging from balti, rogan josh to karahi. The next fifteen minutes after ordering always fly swiftly past as hungry diners await the tell-tale hiss announcing the arrival of the tandoori mix, a sound we’d heard a thousand times before, as regular as clockwork like some tamarind-fuelled timepiece. But you see, that’s where things turned ugly. There was no hiss, only the patter of waiter’s feet and the shrill plink of crockery hitting the table, meat ready served and aggregated in the cursory side-salad that is normally an afterthought and had now become the main event. 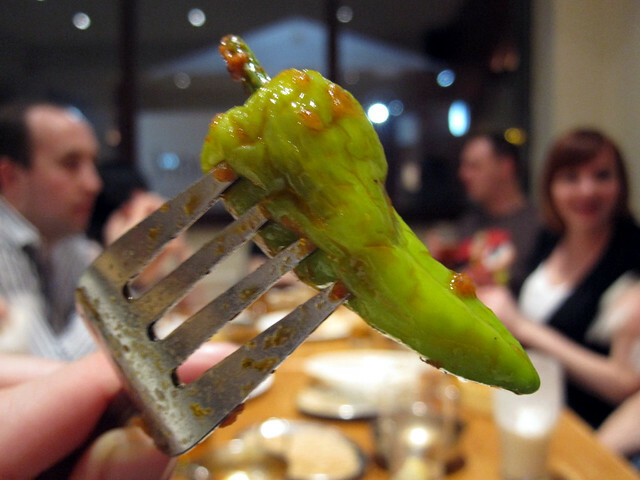 The normally copious amount of papadums and pickles were scant too, only four between the seven of us. Worse still, one friend was disappointed when her king prawn zafrani balti arrived, a meal with a premium price tag of £7.95 attached (compared to the pedestrian £4.95 one pays for a standard dish). After some rummaging around, the normally meat-rich balti had but one king prawn in it. After we’d stuffed our faces with spice, the dependably meagre bill was settled – roughly £70 including drinks for seven people, we left. Something didn’t feel right tonight though and only now upon reflection has something clicked. I read a marvellous book called ‘Go It Alone’ by Geoff Burch recently, in it he described how you should never market a business as unique based on price or quality: a competitor will always come along who’s cheaper or can beat you on quality. Burch suggests businesses should market based on competitive edge: things that make you unique in ways that are less easy to copy like reputation, customer service or presentation. 7 Spices is cheap but it isn’t the cheapest: Nazam’s curry house next door is cheaper still in fact. There are bigger and better curry houses in Leeds like Akbars, Mumtaz and Aagrah who are all about quality, 7 Spices has always been a bit flaky on that front anyway: having served still-frozen food on one memorable occasion. But we still came back. Why? Because the sizzle plate was an event, a fiery spectacle that took a meal to the next level. We looked forward to watching white hot meat waltz about on a dance floor of its own delicious juices. The dishes were once super-charged with extra meat and there used to be the polite, suited manager at the doorway who always recognised us and asked how we were – that too had gone. With those important elements removed, not just now but gradually over the last few visits, they’ve taken away what is unique and memorable about the 7 Spices experience. So what can you take from this? Well, when I read ‘Go It Alone’ it forced me to think beyond price and quality. While they are no doubt important and indeed can be successful (Netto, M&S), they aren’t enough – especially for the self-employed creative genius who cannot compete on price and quality alone against well-established new media agencies. To this end, I put effort into things that make me unique: domain-specific experience working with charities, little touches like spending extra time on-site with clients getting to know them, being personable, upbeat and passionate about how I can help. Things like that. If only 7 Spices knew what made them unique, they could have held on to some loyal fans, but instead reputation has been tarnished and hard-earned trust has been compromised. It’ll take time for my heart to heal after the disappointment of Friday, a friend has suggested a date with the Bengal Brasserie in Burley so I’m going to give that a whirl next week. As they say, there are plenty more naans in the ghee. But there are clearly not plenty more prawns in the ghee…which is a better end line. You summarised this experience well Christopher…does a wasp encased in paint count as a unique competitive edge? Thanks Matt, not least of all for enhancing the pun I clearly missed. You’re not far wrong with the wasp comment either. For the uninitiated, the wasp was some sort of insect fossil cemented to a water pipe in the gent’s toilets at the 7 Spices restaurant. It definitely added to the experience again illustrating that quality really wasn’t their marketing strong point. You failed to make reference to the disturbing entertainment diners were forced to inflict on visiting friends due to their social deprivation caused by the missing sizzle plates. I should have eaten that king prawn before I sent it away. I’m not sure if I’m more annoyed that I couldn’t make it or less annoyed. It May have been crap but it was memorable, and yes you should’ve eaten the prawn, f*$#ing prawns. After careful consideration Matt’s pun is slighlty better, but then it’s all too easy to pick holes isn’t it Gids, ISN’T IT? !